The San Joaquin Valley (“Valley”) is positioned to play a pivotal role in helping California achieve its ambitious goal to meet half of the state’s electricity demand by 2030 from renewable sources. The Valley’s temperate climate and high solar insolation has already attracted investment in over 120 solar energy facilities, which are either already operating or in the planning stages. These facilities average approximately 500 acres in size and generate 67 megawatts in energy -- enough to power 16,750 homes each. They illustrate the potential for the Valley to be a major contributor to the state’s renewable energy portfolio. However, the Valley is also home to some of the richest, most productive farmland in the world while containing some of our most imperiled plants, animals and natural habitats. As a result, identifying good locations for solar projects can entail significant controversy. To help reduce land-use conflicts associated with solar siting, Conservation Biology Institute (CBI), Berkeley Law’s Center for Law, Energy and the Environment (CLEE), and Terrell Watt Planning Associates, with input from the Governor’s Office of Planning and Research (OPR) (collectively the “project team”), undertook a stakeholder-led process, called the “Solar and the San Joaquin Valley Identification of Least-Conflict Lands Project.” Initiated in June 2015, the goal was to explore how multiple and diverse parties could quickly (within six months) identify least-conflict lands for solar photovoltaic (“solar PV”) development from their perspectives. 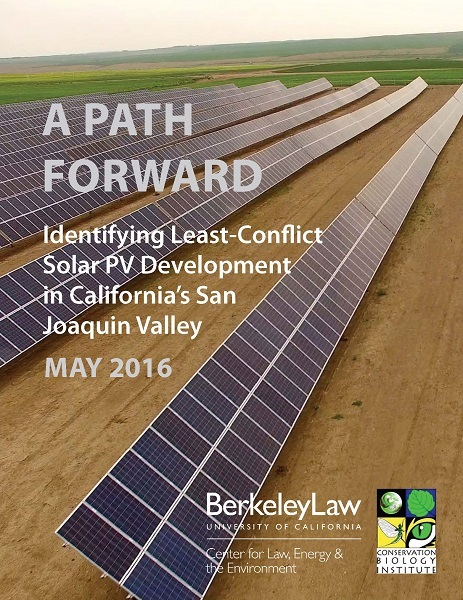 The overarching objective was to answer this single question: Where are least-conflict lands in the San Joaquin Valley for solar PV development? The process included utilizing advanced mapping software to generate a series of stakeholder group maps that identified their highest- and lowestpriority areas. Ultimately, by combining the results of each stakeholder group’s mapping exercises, the project team could identify composite leastconflict areas. In sum, the team identified 470,000 acres of least-conflict land, amounting to roughly 5% of the 9.5 million acres in the stakeholder study area.